This is part two of my explanations regarding the things that have led me here to ministry. To this day, there are people in my life who compare me to my dad. As I’ve gotten older – a lot of the things i knew about him make more sense in my own context. 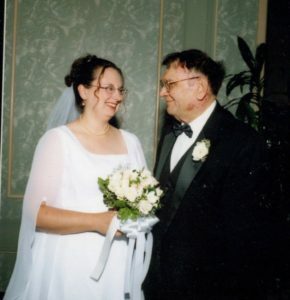 My dad passed away after a long battle with congestive heart failure on July 17, 2007. I attended my first Quaker meeting on July 18, 2008 – more on that later but it’s an important “coincidence”. Kenneth Joseph Walsh Jr. was a traveler. 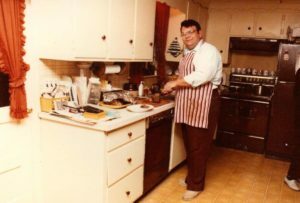 He didn’t have a lot of means or money – but as a traveling electronics/radio salesman in New England, he visited many and held their stories close. 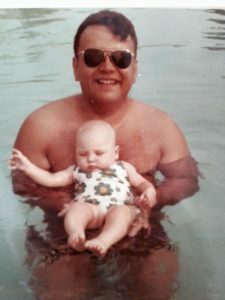 When dad was young, his first introduction to communication was as a HAM radio operator – W1FBT (I still remember it). He attempted to drill a hole in his childhood bedroom ceiling to stick out an antenna. It would be the first of many “outside the box” attempts at changing the shape of his world. He got a part time job at radio shack, and rose to the level of manager very soon. Dad attended college for a few years – Wentworth Institute of Technology. He dropped out to work and never went back. I’m not surprised – he was really smart but hated classroom learning. Dad met my mom during this time – she was a student at Boston State, and he saw her at a local gas station. After asking a friend on the police force to run her plates, he got her number and gave her a call. That relationship – between an Irish Catholic and an Italian Catholic (belonging to the parishes around the corner from each other) , and a graduate of Quincy High and North Quincy High, flourished despite the obvious concerns. They moved to Scituate Ma – “the Irish Riviera” to start a family in the suburbs. 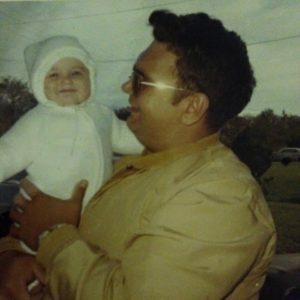 Yes, that’s me and dad – the early years! What stands out for me now, in terms of my own life path, is dad’s insatiable curiosity. Yes, he had a quite mundane job, and average friends and family experiences. However, he was also always living to learn new things, and well beyond the level of mere interest or “hobbies”. He was an accomplished scuba diver, and was on the dive team that searched for bodies with the Quincy PD in the quarries (this was a lovely fact he shared with my middle school friends!). He trained others in dive safety and dove off the coast often. He was a sailor – he often owned a boat, and worked on it in our yard in the winters, and sailed it out of Scituate Harbor in the summer. For a few years he owned the KANNBE – a tuna fishing charter boat, with a crew, that he sent out on fishing day trips with paying customers. He repaired radios – often ones others would not touch. We were especially glad when he repaired those boat radios of a lobsterman friend, who would pay dad in bags of fresh caught lobsters. He was a classical music expert. 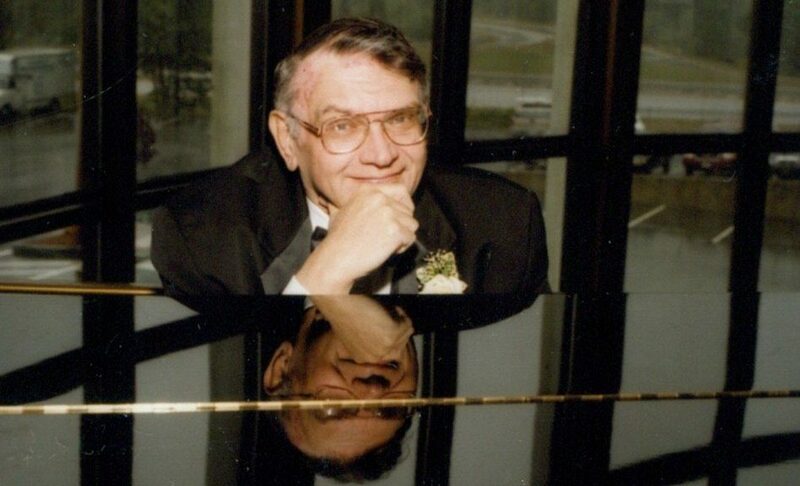 While dad never played an instrument himself, he was an avid listener of classical radio. He even did a college radio show in his early years with Robert J Lurtzimer (of Boston Classical Music radio fame). He had specific musicians he really liked, and orchestral versions of pieces, and would always recommend to me certain composers and recordings. Dad was also a huge collector of music – we would take trips to Tower records in Boston for recordings of my classical pieces for college. Dad was especially fond of Sousa marches, and had a whole collection of different versions. He loved it when my performances ended with a good Sousa march! Dad loved trying new foods. He was raised on my grandmother’s homemade pasta and meatballs, but would meet me at college and we would go to a chinese restaurant where he would try all the “weirdest” things on the menu. He appreciated the stories and culture around the food. He flew planes. 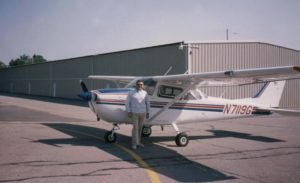 Dad was a lisenced private pilot – and a proud member of the Experimental Aircraft Association (EAA). He was a member of the local fly club at the Cranland airport, and volunteered to train kids in flying. He built a plane with friends. The plane started in pieces in our garage, hidden from my mom. Dad helped found a “fly in breakfast” at the airport, where folks would fly in from all over for pancakes and conversation. Dad traveled. As a traveling sales rep in New England, he went all over. Every place had a story. He would eagerly connect with all these folks every year when he visited. He knew the best diner in every town,and quirky places to stop and learn about new things special in the area. I share those specific stories and traits, because of how much they remind me now of how I see the world. 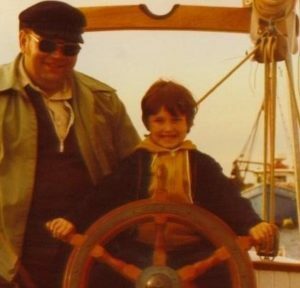 Dad never knew me as a Quaker – but he knew me as an eager student with many interests, a hard worker with many jobs and roles, and a person who loved to learn about other cultures and people and their lives. The fact that I do this now, when I visit Quaker meetings, is no surprise to me. That curiosity dad carried is what takes the lead when I travel among Friends. Every meeting has a story, a way in which Friends are being faithful, and being in community, and holding struggles of life tenderly and with concern. As my dad would share stories of the people he met, I share those stories myself as I travel. I have a clear feeling that dad wold be proud of his daughter, a “traveling minister” among Friends. He had his peculiar people, I now have found mine.